The historic buildings surrounded by magnificent trees and gardens welcome you to this unique location, Kalyra Heights Belair. Unique because it is the original Kalyra and has seamlessly interwoven history with modern architecture, community, leisure, and activity for those who enjoy community life and friendly neighbours. Built over time, there is sure to be a style of living to suit you, whether it is single bedroom through to three bedrooms, apartment living or villas in grounds with spectacular views of Adelaide. On a fine day sitting outside watching the ships slowly move across the sea on the horizon or the planes flying in to land is simply wonderful. In the evening, watch the glittering carpet of lights come to life as dusk falls and if nature appeals, the rosellas, lorikeets, kookaburras and koalas will keep you entertained. Kalyra Heights Village is nestled in the slopes of the hills at Belair and represents a blend of history, beauty and tranquillity. Located in the dress circle of the Adelaide Hills, the Kalyra Heights Village has progressed significantly since construction first began in 1992. In total there are now 105 Independent Living Units with a range of floor plans and styles all offering high standard, quality, secure, modern and desirable accommodation designed to take advantage of the outstanding city, sea and hills views available on the Trust’s 20-acre property. The site is within easy reach of the local Belair and Blackwood centres and 20 minutes from the Adelaide CBD. The Village Centre, “the jewel in the crown”, presents to our residents and their guests a building full of history and charm, which is both comfortable and spacious, and very stylish. Facilities include a craft room, spa, billiards/darts, extensive library, professional consulting suite, salon hairdresser, gymnasium, games room for indoor bowls and table tennis, a separate meeting room for our various interest groups plus an elegant lounge/dining area complete with an open fireplace and a cinema. The Centre’s peaceful setting is complemented by landscaped gardens, an outdoor bowling green, a separate artist studio and well-equipped workshop (men’s shed) complex. 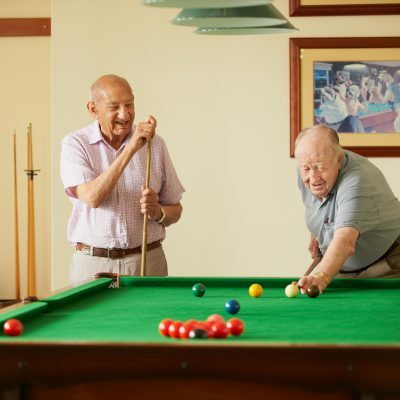 The adjacent fully accredited Kalyra Belair Aged Care facility provides a reassuring presence and peace mind for residents wishing to plan for every future potential need. The 92 place Aged Care facility is surrounded by tranquil gardens and with superb views which stretch over the city and to the sea.